I've never been 100% comfortable with the idea of Valentine's Day. Let's face it, when you're alone without a "significant other", the day and all its red, smoochiness is just one big embarrassing bummer. Even when you're partner'ed up, it still reeks of obligation. You MUST buy chocolates, flowers or jewellery, or you're a horrible, heartless person. Pu-lease!!! I don't like anyone telling me when and why I should gift my loved ones -- I'll do it throughout the year, thanks... and because of all this February 14 overt gooeyness that I despise year in, year out, I happen to LOVE these freaking fantastic Bittersweets -- they're Love Hearts gone hilariously wrong! Instead of "I Love You", "Sugar Bear" and other sickly sweet sentiments, these Despair Inc. goodies declare: "U Turn Me Off", "Mommy Issues", "Awful In-laws", "Aging Poorly" and my personal fave, "Dog is Cuter." Choose from three hilarious black trimmed heart-shaped tins -- Dumped, Dejected or Dysfunctional, and celebrate anti-Valentine's Day! 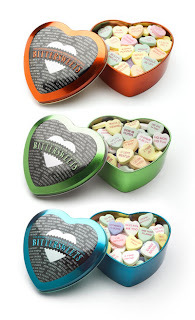 *um....one of the candies in the 'Dumped' tin has the message, "U Have a Blog" --- just ignore that one, will you?